On Monday night, concert tees, leather and your occasional fedora-wearing fans gathered at the Save Mart Center for a night of good music. Hipsters rejoiced this summer when it was announced that The Black Keys had added Fresno to its 2012 world tour. 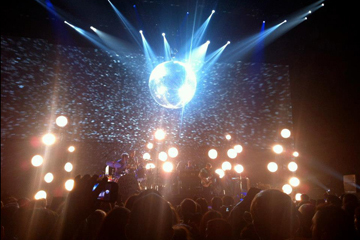 The concert promptly began at 8 p.m. with The Black Keys’ opening act, Tegan and Sara. You might remember Tegan and Sara from your high school years, but the sister duo managed to bring in a good number of younger fans. Even if you were not a fan or knew who they were, you could find yourself moving and bopping to their songs. Sara lightened up the audience with jokes about having to stop drinking and smoking before the show because she didn’t want to be the second Canadian of the week to vomit on stage. She was referring to Justin Bieber, who vomited in the middle of his concert earlier this week. The sisters played an hourlong set including a new track called “Closer.” Expect to hear more from these two Canadians, who said their new album will drop in the beginning of next year. The stage was decked with a variety of lighting combinations for each song performance, and large screens were placed on the sides for the audience who were in the back or were unlucky enough to stand behind a tall person. Dan Auerbach, lead singer and guitarist, and Patrick Carney, drummer, are men of few words. Auerbach said a couple of words thanking the audience, but they stuck to what they were there to do­ —play music. Throughout the concert, Auerbach and Carney did not just play songs for their newest album “El Camino,” but serenaded the audience with old hits from their 10-year career. You can see the audience in the reserved seating standing as The Black Keys played, while the crowd on the floor had people jumping and dancing. The floor crowd even had a few younger fans twho decided crowd surfing was a good idea. Carney, besides showing his talent of keeping his glasses on while playing, showed his intense form of keeping the beat and getting into the music throughout the entire 90-minute set. After finishing the set list, the band left the stage, but came back out to the screaming fans for an encore that made the crowd go wild once a giant disco ball was lowered onto the stage. With the performance of “Everlasting Light,” Auerbach showed his unexplainable vocals that range from garage, blues, alternative and indie rock, the genres that best describe the band’s style of music. Monday night, The Black Keys showed that rule number one to sound good live is to have talent.